Heat oven to 400°F. Place 1 pie crust in 9-inch glass pie plate as directed on box. Unroll other crust on counter or cutting board. 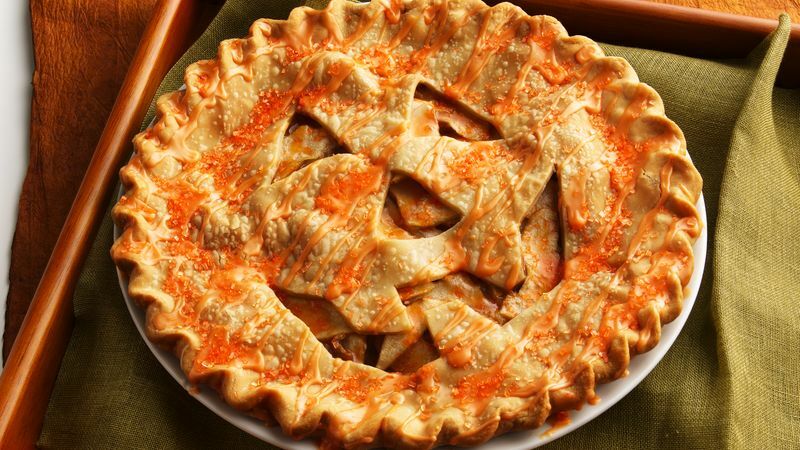 Using small knife, cut jack-o’-lantern face into top crust; cover loosely with towel or waxed paper. Spread preserves over bottom of crust in pie plate; sprinkle with cookie crumbs. In large bowl, mix pears, gingerroot and brown sugar. Spoon pear mixture evenly over crumbs; sprinkle with butter pieces. Cover with top crust; seal edges and flute. Cover crust edge with strips of foil to prevent excessive browning. Bake 15 minutes. Reduce oven temperature to 350°F. Bake 40 to 45 minutes longer or until bubbly and top is golden brown. Remove foil; cool on cooling rack about 20 minutes. Meanwhile, in small bowl, mix frosting ingredients. Gently brush frosting over top of warm pie. Serve warm or cool. Omit the frosting; instead brush unbaked pie with 2 tablespoons milk, and sprinkle with orange decorator sugar crystals. Look for jars of grated gingerroot in water in the produce section. The fresh flavor and convenience can’t be beat. You can also grate fresh gingerroot ahead of time and freeze, then use as needed.